Sleepers Hill is a residential road in Winchester, Hampshire, England. 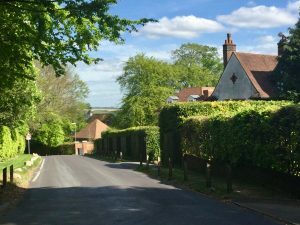 Sleepers Hill is a “private street”: that is, it has not been “adopted” for maintenance by Hampshire County Council. The roadway is below the standard required for a publicly maintained road, as it is not wide enough and is not built to standard depth and surface quality. The road is maintained by the residents’ association, the Sleepers Hill Association. However, the public have right of way over the road and, as a private road to which the public have access, it is subject to the normal traffic laws. Most houses on Sleepers Hill have names, not numbers, so they can be difficult to find. Winchester City Council’s LocalView facility can be used to obtain an alphabetical list of houses: use the Address Search to find the street, select the house, then click the ‘On the Map’ tab to show the location.